Chökyi Dhöndrup was born to a Nepalese family in Yolmo (Helambu), in the Kingdom of Nepal. The Eleventh Karmapa Yeshe Dorje sent an envoy with precise instructions on how to find this boy. With the permission of his parents, he was taken to Tibet at the age of seven, and enthroned by the Karmapa as the eighth Shamar incarnation. He received the full transmission of the lineage from the Karmapa and he also studied with the third Treho Tendzin Dhargye, Goshir Dhönyö Nyingpo and other masters. He traveled to China and Nepal and benefited many beings through his teachings. He passed away at the age of thirty eight, in the Water Mouse year. 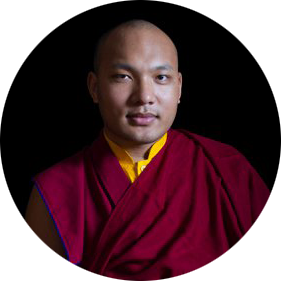 He passed on the full Kagyu lineage to the Twelfth Karmapa, Changchup Dorje. These details about Palchen Chökyi Dhondrup are compiled from Karma Gyaltsen’s book called kam tshang yab sras dang dpal spungs dgon pa, Szechwan edition, p. 136-7. May this be virtuous!